"Vafiadis said. The petrochemical value chain is global and dynamic with shifting drivers, and plastics sustainability is no less a fundamental driver, IHS Markit said." 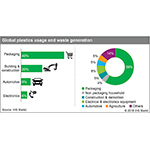 HOUSTON--(BUSINESS WIRE)--The growing global plastics sustainability movement is one of the biggest potential disruptors for the plastics industry and is putting future plastics resin demand and billions of dollars of industry investments at risk. 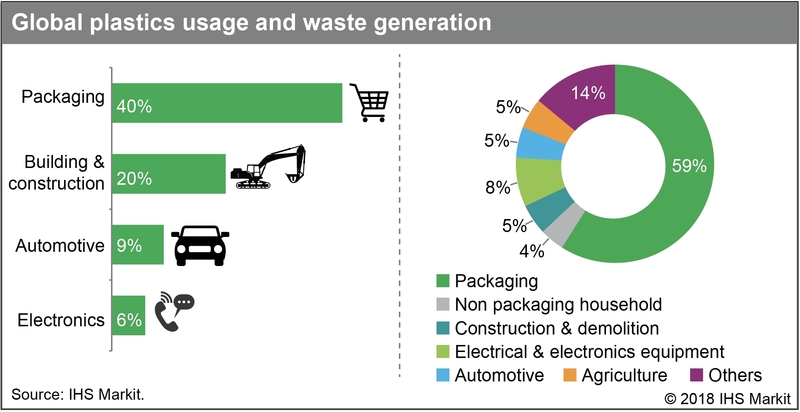 Sustainability efforts around plastics will, in fact, have significant implications for the entire petrochemical value chain, extending to feedstock markets, according to initial research from IHS Markit (Nasdaq: INFO), the global business information provider. The study, Plastics Sustainability - A Sea Change: Plastics Pathway to Sustainability,” from a research alliance led by IHS Markit, offers a base case (trend line) and alternative case (maximum viable threshold) analysis of the plastics demand growth for six key plastic markets. The study provides a granular view of the impact of sustainability on specific end-use segments for these key resins as well as analysis of the implications for upstream base chemicals and feedstocks for the years 2018 to 2030. Spurred by images of the “Great Pacific Garbage Patch,” a growing accumulation of floating ocean plastic waste estimated to be larger than France and weighing in excess of 593 million pounds*, many global consumers have become increasingly outspoken in regards to plastics use and recycling. In some cases, consumers are pushing for bans on plastics, particularly single-use plastics, or are choosing substitute products to minimize plastics waste or both, IHS Markit said. Some figures shared by both the Ellen Macarthur Foundation** and the World Economic Forum, estimate that by 2050, there will be more plastic than fish in the ocean, and that annually***, according to THE OCEAN CLEANUP, 8 million metric tons of plastic waste are added to the world’s oceans, much of it from rivers and mismanaged plastic and municipal waste from Asia. By 2025, the non-profit agency estimates the amount of plastic waste added to the world’s oceans will nearly double. “Plastics sustainability is, by far, the most critical issue facing the global base chemicals & commodity plastics industry during the decades to come,” said Nick Vafiadis, vice president of plastics research at IHS Markit and lead author of Plastics Sustainability - A Sea Change: Plastics Pathway to Sustainability. “During the past decade, we’ve seen a rapid increase in consumer activism, and regulatory bans and restrictions regarding plastics consumption and the handling of plastics waste, particularly as it relates to single-use plastics. This is a trend that is going to continue, and the entire petrochemical value chain will be impacted by the coming changes in plastic demand growth, which is what we seek to clarify and quantify in the study,” Vafiadis said. The demand for plastics also effects upstream feedstock demand (olefins, aromatics and chlorine), which is critically important to the petrochemical value chain, as well as for integrated oil companies seeking refuge in petrochemicals from uncertain refining markets, Vafiadis said. The IHS Markit multi-client study examines regulatory changes, bans and policy initiatives in key countries and regions, including China, Europe, India, the United States and Canada. The research also includes insight and analysis from More Recycling, a research and consultancy focused on the recycling of post-consumer materials, specifically plastics; and Environmental Packaging International, a consultancy specializing in environmental compliance, product stewardship and sustainability related to packaging and products. “We expect the trend toward greater sustainability in the industry to continue, which is certainly a positive development, but the pace of change, the prospect of greater regulations, including bans, and consumer deselection of certain plastics end-use products is creating significant investment risk and market uncertainty for plastics producers, processors, and consumer packaging companies, who must invest now for the future,” Vafiadis said. “Additionally, municipalities and governments are also tasked with investing for growth to ensure they have a comprehensive recycling infrastructure that is optimal and meets constituent expectations, but also is adequately funded. This requires tremendous planning, and a multi-layered view,” Vafiadis said. The IHS Markit study will be an ongoing effort to address future market demand growth for traditional plastics, including polyethylene (PE, including high-density, low-density and linear, low-density), polypropylene (PP), polystyrene (PS), expandable polystyrene (EPS), polyethylene terephthalate (PET) and polyvinyl chloride (PVC). The study will also look at newer and evolving technologies, post-consumer resins (PCR) and more sustainable options such as bio-based plastics, biodegradable plastics, renewable chemicals, and recycling. This special, multi-client study builds on existing IHS Markit research in the area of sustainability, which includes a sustainability series of specialty chemical and economic research reports covering a wide range of topics from CO2 emissions and carbon capture technologies, to water reclamation/desalination technologies, water treatment, sustainable fertilizers, bio-based and biodegradable plastics, renewable chemical building blocks, and renewable energy/fuels such as hydrogen, etc. According to IHS Markit, global demand for PE, the world’s most-used plastic, has nearly doubled during the last 20 years. IHS Markit expects 2018 global PE demand to exceed 100 million metric tons (MMT). However, significant new market pressures, including a rise in consumer expectations around sustainability, along with tightening environmental regulations in mature markets such as Europe and key growth markets such as China, could threaten future demand growth, which is why producers are keen to understand and plan for the implications, Vafiadis said. In the IHS Markit study, researchers examined the potential risk to the entire supply chain from energy to resins. That initial analysis indicated that a 10 MMT decline in PE led to a 10 MMT loss for ethylene and would reduce global operating rates for ethylene production by 3 percent to 5 percent, which is equivalent to slightly less than two years of demand, IHS Markit said. That, in turn, could reduce global demand for natural gas liquids (NGLs) and naphtha, depending on ethylene feedslate assumptions. “A significant reduction in the demand growth for plastics could have a fairly pronounced impact on refiners, in particular, who are already facing long term declining demand for transportation fuels globally due to mobility changes and increasing fuel efficiency standards in the world’s automotive fleet,” Vafiadis said. “To counter that growing demand destruction and market uncertainty, refiners are increasingly seeking refuge in petrochemical markets, but that option would also become less viable if there is a rapid or significant decline in plastics resin demand growth,” Vafiadis said. According to Robin Waters, director, plastics planning and analysis, chemicals, at IHS Markit and co-author of the IHS Markit study, there is a clear shift happening in the approach toward sustainability moving from reactive to proactive. “In the reactive phase, the target was preventing littering and focusing on plastics waste,” Waters said. “Thereafter, the focus moved to managed disposal of plastic waste (incineration, landfill, export, recycling). Now, we are focused on circularity, often described as a circular economy, which makes the producer a stakeholder in the careful management and reuse of plastic and reducing end-waste. This is critical, but before you can truly achieve viable solutions, you have to understand the scope of the challenge or the opportunity, which plastics sustainability presents, and that is what our study will articulate,” Waters said. Europe uses a three-pronged approach to achieve this by setting targets for plastic recycling, by enabling compliance through EPR (Extended producer responsibility), creating a legislative framework to implement compliance including taxation, and then introducing a certification mechanism for eco-design, Waters said. This design standard will make designs circular, and allow products to be approved so that they are based not solely on functionality, performance or cost, but on circularity, so they are 100 percent recyclable. Designing plastics from the start so that they can be more easily recycled for a second life is a key challenge for producers. This life-cycle planning is a design challenge that some companies are already exploring, and it, along with the issue of plastics and sustainability will be key points of discussion at the upcoming Global Plastics Summit (GPS) 2018, October 30 – November 1, in Chicago. Experts from IHS Markit and the Plastics Industry Association will discuss the latest market outlooks from key industry sectors, and will feature senior business leaders sharing their companies’ strategies for success and innovators presenting the latest in plastics technologies. Bob Maughon, R&D vice president, Packaging and Specialty Plastics and Hydrocarbons, The Dow Chemical Company, will discuss sustainability as a catalyst for innovation in packaging. Don Thomson, president of The Center for Regenerative Design and Collaboration, will address turning plastic waste into building blocks for other uses. To speak with Nick Vafiadis or Robin Waters, please contact Melissa Manning at melissa.manning@ihsmarkit.com. For more information on the Plastics Sustainability - A Sea Change: Plastics Pathway to Sustainability , contact Jennifer.eyring@ihsmarkit.com .